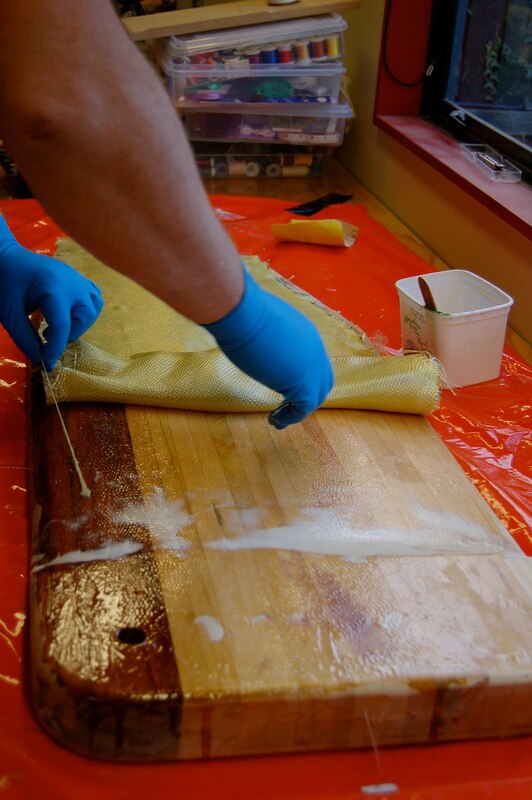 Here is the centreboard being coated in one layer of 400gm Kevlar and two layers of 200gm glass. I want lots of torsional rigitiy incase I hit something. I had to sharpen my scissors to cut kevlar. One edge has fine serration's and the other is straight. Made a big difference to being able to cut kevlar. I used two layers of glass as it is easier to sand the glass than kevlar. Kevlar just goes all fuzzy. You can see the fairing compound over the lead. All done and coated in peel ply.